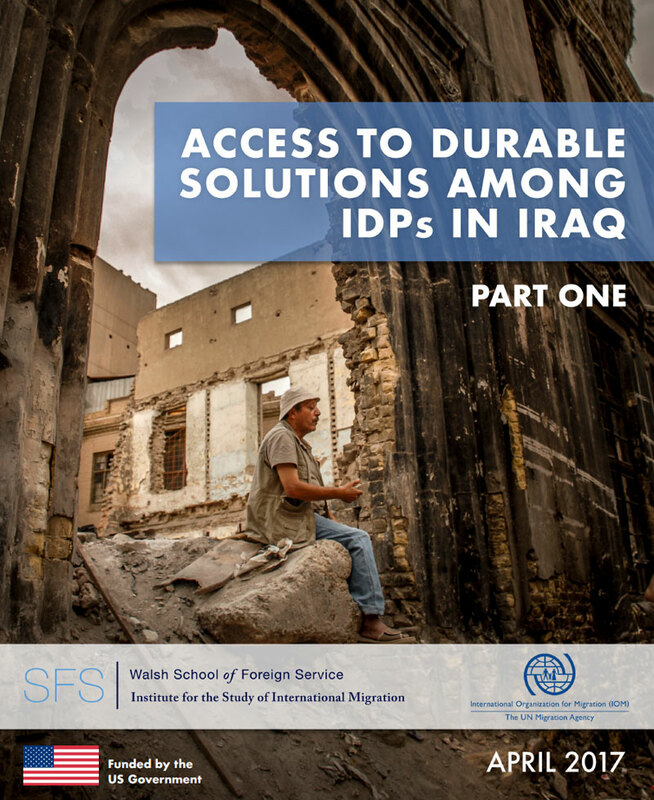 Iraq - The research study “Access to Durable Solutions Among IDPs in Iraq” released today (06/06) studies the experiences of displaced Iraqis, their adaptation to displacement and durable solutions. This study was conducted by the UN Migration Agency (IOM) and Georgetown University’s Institute for the Study of International Migration and the Centre for Contemporary Arab Studies. The study found that only through security will Internally Displaced Persons (IDPs) find durable solutions. More than 3 million Iraqis continue to be displaced by the conflict that began in January 2014. In this context of long-term displacement, the durable solutions study aims to help build a better understanding of IDPs’ realities and progression towards durable solutions, in order to foster stability and integration. Data was collected through a survey administered to 3,900 Iraqi IDP families living outside of camps in four governorates: Baghdad, Basrah, Kirkuk, and Sulaymaniyah. Qualitative interviews were also conducted with host community members and IDPs. Additional planned rounds of data collection will enable comparison of the factors that shape IDPs’ search for durable solutions as they return, resettle and integrate. Displacement is an effective protection strategy; the study found that personal security in displacement depends on contextual factors, particularly on social connections. The vast majority of IDPs were welcomed by the host communities in Iraq and in Iraqi Kurdistan; only a tiny minority of IDPs reported experiencing discrimination or violence due to their displacement status. However, IDPs experience a significant worsening in their housing standards and general quality of life as a consequence of their displacement, and moving to slum-like dwellings or sharing houses and borrowing money from family and friends seems to be the most widespread strategy to cope with the decline in living standards. Factors like unemployment, employment in the informal sector and lost hope in finding a job are all high among IDPs, create a disheartened workforce, and increase vulnerability to exploitation and uncertainty. The study also notes that displacement is an urban phenomenon. The presence of support networks pulled the majority of IDPs away from rural areas and toward urban locations to connect with family and seek work. This adds to the difficulties in finding appropriate jobs and integrating and adapting to the urban lifestyle. In addition, abandoned fields in rural areas are exposed to long-term damage that may hinder livelihoods upon return. “This study on Iraqi displacement highlights the importance of safety and security as the main requirement for accessing durable solutions,” said Thomas Lothar Weiss, IOM Iraq Chief of Mission. “Some Iraqis have found durable solutions with assistance from their family, friends and host community members, all of whom we commend. The study also notes that international aid has played an important role in meeting the needs of displaced Iraqis. IOM Iraq in cooperation with humanitarian partners will continue to provide life-saving solutions for IDPs as long as this aid is needed,” added Weiss. “The combination of a longitudinal survey and in-depth interviews with IDPs and host community members allows us to see trends and flesh them out with concrete examples,” said Rochelle Davis of Georgetown University, Walsh School of Foreign Service. “Moreover, the data collectors’ knowledge developed from following the families over time offers a much more complex and accurate understanding of what constitutes durable solutions for Iraqi IDPs,” continued Davis. The research was funded by the US State Department, Bureau of Population, Refugees, and Migration through IOM’s Community Revitalization Program (CRP), a multi-dimensional programme that aims to assist returnees, IDPs and host community members affected by protracted displacement through the holistic socio-economic recovery of the communities they call their home.